I have been having a think about how blogging software can be used inside collaboration and co-publishing ventures, especially from a heritage point of view. This is part of my ongoing interests but there also might be some projects which I can apply it to. In the process I have been reviewing some examples. Two of which I thought might be worth sharing? First, the online Samuel Pepys Diary. This is an old favourite. Also, long before the internet thing , I have been a fan of Samuel Pepys, the 16th diarist of the restoration et al, who wrote almost continuously about his life and work in London during the years 1661 to 1669. I don’t know what appealed so much – the immediacy of the writing – the sheer guts of his ambition, and of course the brio in which he takes the world by the scruff of the neck and makes it work for him. Somehow he just fits the world my mind constructs when I think of what it would have been like trying to make a living in London at that time. But he also seems to travel over time - a contemporary 17th century project manager who is determined to get himself a nice apartment – make some friends – have some influence – and in the process make his mark on the world. I’m certain if he was alive today he would be straight into this Internet thing. I guess the totally inspiring Phyl Gyford had a similar idea. He's the man, who for a couple of years now has been putting the diary up as a daily entry on the truly inimitable Diary of Samuel Pepys, using Movable Type with PHP and MySQL] to create a blogging tool on steroids. He has also, from the beginning thrown the whole project out to others who share knowledge and interest in both Pepys and the project. This group spends its time adding annotations to the entries - especially the people, places, and incidents mentioned in the text. Places are also marked on a parallel inline Google Map layer, and now, since December last year he has added 2797 inline Wikipedia pages. The result is a context machine which takes the core of the Pepys project and makes it a model for collaborative scholarship. It’s also a brilliant example of how to take the likes of Movable Type and really drive it as a publishing /collaboration tool. The other example which caught my eye over the holiday is also from the UK. 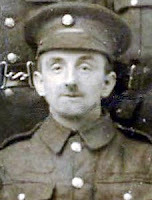 It's a blog of the writings of Private Harry Lamin one of the Yorkshire and Lancashire Regiment who ended up in the blood and mire of Messines Ridge and Passchendaele. Just like his family back home, currently we have no idea if he is going to survive This is a deliberate tactic from the blog creator, Bill Lamis , his 59 year old grandson, maths and IT teacher. By the look of the comment pages [on the blog] he seems a little overwhelmed by the attention he has created with his project. Both CBC and the BBC have made news items out of it. The CBC is here. The BBC one is here. It would be interesting to hear if there are any plans to do something similar here in New Zealand. There must be some excellent possibilities somewhere? Thanks for the pointer to the Pepys diary. I've seen the second one before and you're right, the grandson is very surprised by what's happening. I guess in his mind it's a simple, fun thing to do that's very personal. Just goes to show that the mashing up of old and new can be very powerful. A diarist, such as Pepys, is an obvious fit with blogging. But certainly these are good examples. I'm grabbing the RSS for that Pepys 'blog'... it might be the only way I get round to reading it, and it's sure to be interesting. paul tudor: I don't think anyone can be mistaken over how their own blog might be used. If they see it as a personal diary, then that's what it is. If they're sensible about that they'll disable comments, lock entries and not publicise. Voila - a diary. Given that webspace is effectively free for the user there isn't a problem in doing that in the least. The essential element of a diary is timestamped text (ok, the text can be an embedded image/video etc but you get what I mean). This is what blogs are; all else is bells and whistles, even comments; see tumblr for an example of quick-and-friendly blogging without even the usual commenting feature - one has to use third party code in the templates if that's what's desired. Of course there's a world to be gained by treating a blog as a foundation for a community, a platform for a consultancy career, a voice for a passion; but not wanting to do so is in no way mistaken. The interesting thing for me is what media/widgets/etc Pepys would have used, and how he would have responded to a flamewar. I'm predicting that he'd go big on the lolcats.